The FOX Jet Flies Again! Are you ready for take off? 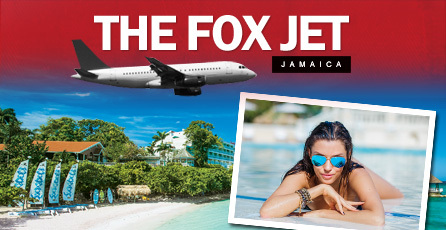 The Fox Jet flies again to Sandals Ochi Beach Resort! Enjoy the heat of the Caribbean!! Sun, surf, palm trees and cocktails! Fredricton radio station – 105.3 The Fox – wants to jet you off to the beautiful island of Jamaica! You could #TXT2WIN an all-inclusive trip for two. Relax on the powdery white sand beach or float away in 6 impressive pools! Listen for the cue to text the code word JAMAICA to 10530 with Sandals Resorts, Air Canada Vacations and Fredericton’s Best Rock, 105.3 The FOX! You can enter on any Canadian mobile device – Standard text rates may apply [FREE if you have an unlimited text plan – same rate as texting a mate]. Texting Goes Live On Winnipeg’s 99.9 BOB FM.